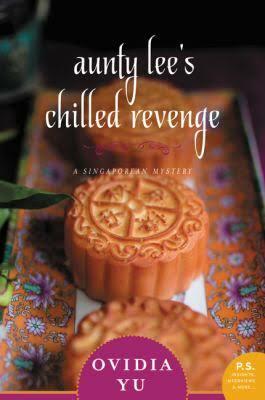 “Rosie “Aunty” Lee—feisty widow, amateur sleuth and proprietor of Singapore’s best-loved home cooking restaurant—is back in another delectable, witty mystery set in Singapore. Slightly hobbled by a twisted ankle, crime-solving restaurateur Aunty Lee begrudgingly agrees to take a rest from running her famous café, Aunty Lee’s Delights, and turns over operations to her friend and new business partner Cherril. The café serves as a meeting place for an animal rescue society that Cherril once supported. They were forced to dissolve three years earlier after a British expat killed the puppy she’d adopted, sparking a firestorm of scandal. The expat, Allison Fitzgerald, left Singapore in disgrace, but has returned with an ax to grind (and a lawsuit). At the café one afternoon, Cherril receives word that Allison has been found dead in her hotel—and foul play is suspected. When a veterinarian, who was also involved in the scandal, is found dead, suspicion soon falls on the animal activists. What started with an internet witch hunt has ended in murder—and in a tightly knit, law-and-order society like Singapore, everyone is on edge. The offical website of author Ovidia Yu.